ETA 5 Dec 2017: So much has changed since I did this review. Please read my article The Truth about Doreen Virtue’s Conversionfor reasons why I no longer link to a sales page for this deck and why I have chosen to boycott any and all Hay House products. Before looking through the cards, I cleared the deck of unwanted energy by holding it in my left hand and tapping on it lightly (just once) with the knuckles of my right hand. I then charged the deck by holding it to my heart (cards fanned) and asking Archangel Jeremiel to bless the deck with the power to transmute any fear or negativity that comes up in readings I do for myself and others. This method is the one Doreen recommends for all her Oracle decks and I really like it, although I don’t pray using her wording. One quirky thing that made me smile as I first looked at each of the cards was that Doreen has chosen to put herself (as a mermaid, of course!) in the 9 of Water (Cups). Go girl! I would totally put myself in a deck that I was co-creating with an artist, although I’d probably insist he make me The Empress. It’s a chunky deck, about the same size as the Voyager Tarot but on thicker card stock. The cards need to be large because the images are very rich in detail. Also, the border is quite large to make room for the condensed card meanings. The artwork is absolutely gorgeous! If you struggle with shuffling large decks and, like me, have small hands, you might want to check out this vlog where I show you How To Shuffle a Large Tarot Deck. Because I have the 10 of Swords as my central theme card in my Solar Return reading, I paid extra close attention to the message of the Angel Tarot 10 of Air, and I absolutely love the positive message printed on the card: “The end of a difficult situation. Embrace the change, and expect things to get better now.” It’s not denying that things have been difficult but it’s choosing to focus on the light at the end of the tunnel. Two other cards I really resonated with were the Knight of Air/Swords (my birth courtier – third decan of Capricorn) and the 9 of Earth (Pentacles), which has been ‘haunting’ me all year. Both are beautifully illustrated. This Knight of Air/Swords is one to aspire to rather than be slightly embarrassed about (the RWS one always makes me cringe because he looks so angry!) 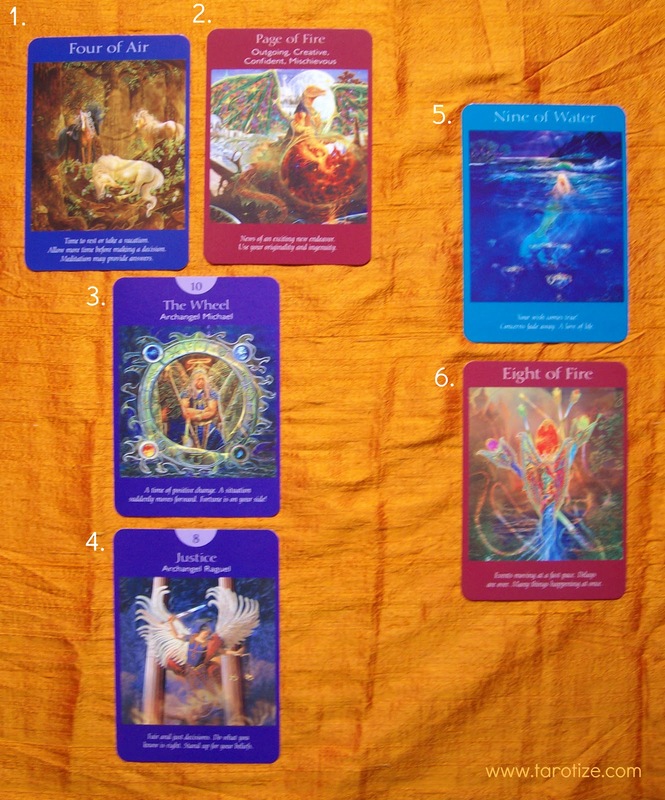 and the 9 of Earth/Pentacles promises continued business success on my path of self-employment. I’m thinking of blowing the latter up, framing it and placing it above my desk. The face of the rider in the 6 of Fire (Wands) isn’t quite right – Click the image to enlarge and you’ll get my drift. The words on the 5 of Air (Swords) seem too wishy-washy. 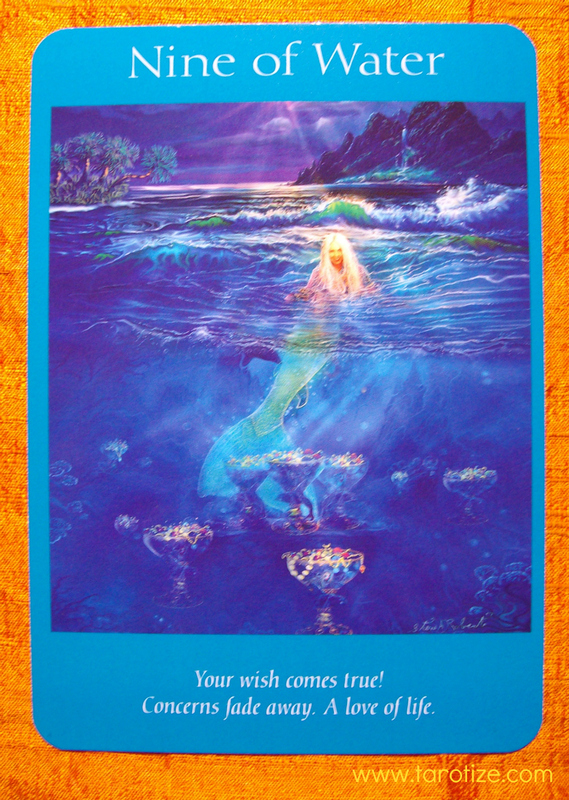 I can’t take ‘unwise choice’ for the 5 of Swords – sorry! The Archangel Gabriel as a the choice for The Empress is one I can’t quite embrace either. We need a more Venusian Angel here… Anael would be ideal but Chamuel would do at a pinch. Also, Gabriel appears in his male form to me… and I’m picky about both the Empress (my Soul Card) and Gabriel because he is one of my five personal angels. 1. Describe yourself in three words – 4 of Air (Swords): Peaceful, gentle, soothing. 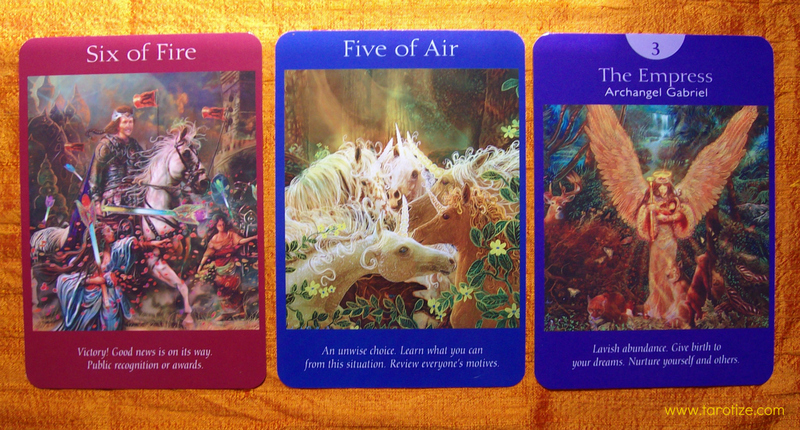 I make a great deck for your daily meditative focus! 2. How would your best friend describe you using only three words? – Page of Fire (Wands): Confident, brave, fun-loving. He sees a different side of me because he is very good at encouraging his friends to come out to play. 3. What gift do you bring? – The Wheel (Archangel Michael): I bring you lots of new and perhaps unexpected opportunities. Brace yourself and hold on tight… because I promise you this – you won’t want to miss any of them! Best of all, you can rely on my keeping you safe even when the ride gets a bit bumpy. 4. What do you expect in return? That you do what you can to keep yourself balanced, especially where close relationships are concerned. 6. Is there anything else you would like to tell me about yourself? – 8 of Fire (Wands): Yeah, forget what you thought you knew about timing. Things are speeding up and the time between making a wish and seeing it manifested may at times be pretty much non-existent!